And finally my 30-hour journey has come to an end. And for the next 5 days, Samoa will be home for me. For now, I have just enjoyed a long relaxing warm shower, followed by a light dinner - Samoan chicken soup with vegetables. And now I am reflecting back on the day today and preparing for the meetings scheduled for the next few days. The delightfully colourful Samoan currency is called the Tala which is subdivided into 100 Sene. The Tala and Sene are apparently Samoanized names for Dollar and Cent! The drive from Faleolo to Apia was along a beach road with lovely views of the sea. The driver did mention that rising sea levels had caused beaches along the roadside to go under and there was increasing salinity inland, which is a big issue in the Pacific and the Caribbean, as much as in other low lying countries and cities, like much of Bangladesh or Jakarta. It's not funny how the remoteness of these Pacific islands influences the political and economic decisions their governments make. Two examples from Samoa stand out - one is the shift across the International Date and shifting from driving on the right of the road to the left. In 2009, the government decided that the country would shift driving on the right side of the road to the left to align it with its regional partners in the Pacific and particularly, Australia and New Zealand from where most cheap used-cars are imported. That decision was contested in courts but was finally implemented. The implementation came along with a two-day holiday to get Samoans used to the change and a three-day ban on alcohol sales, to avoid accidents due to driving under influence. 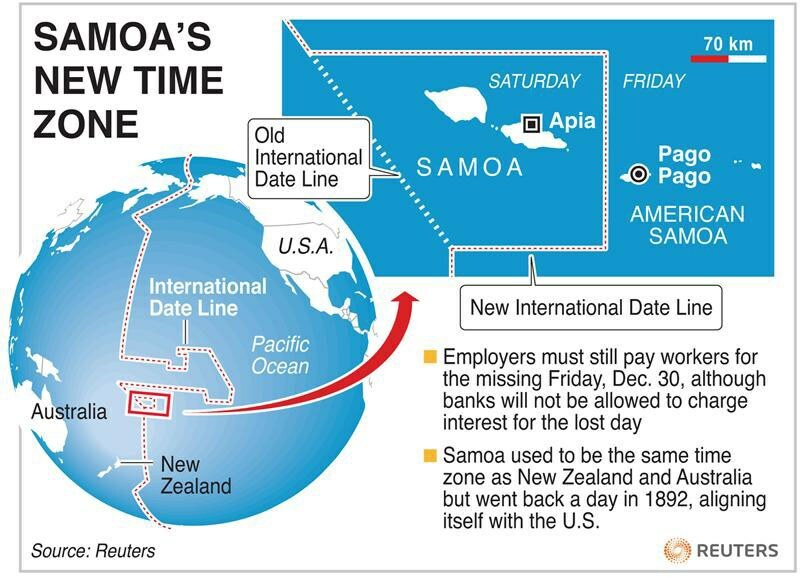 In December 2011, the country shifted west over the international dateline - Samoa skipped a day to align their business days with their main trading partners, Australia and New Zealand, which was expected to impact the country's economy positively by aligning the work week with its major trading partners. This was done by quite literally skipping December 30th, making Samoans lose a day of their lives as they jumped the clocks 24 hours ahead (imagine your woes in 2011, if you are a Samoan and your birthday is on December 30th!). 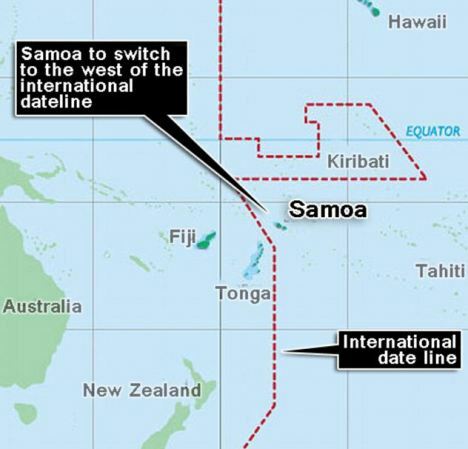 When the clock struck midnight on Thursday, December 29, 2011, the calendar flipped over to Saturday, December 31, 2011, switching from the same time zone as American Samoa to align with the rest of Asia, New Zealand and Australia. And it wasn't Samoa that did that shift. Tokelau, a territory administered by New Zealand to the east of Samoa, also did the same, for similar economic reasons. The momentous event was celebrated in Apia with fireworks. Postage stamps commemorating the occasion were issued with the message "Into The Future". So Samoa, along with Kiribati and Tonga are the first countries to welcome the new year! Till 2011, Samoa was the last country to celebrate the new year! Another strange thing I witnessed in the hotel lobby was the presence of men dressed as women, with long hair, lipsticks and all that stuff that they call eye-shadows and the likes. I was told that these are people from the third gender of "Fa’afafine", which when translated literally means "in the manner of" (fa’a) "woman" (fafine). Fa’afafines as a concept has always existed within Samoan society. Pre-Christian Samoans accepted that every individual, man or woman, had a separate role in society. Accordingly, it was and still is still acceptable today for a male child to be feminine, for example. Boys who display marked effeminate behavior in childhood are recognized to be Fa’afafines and are fully accepted within their families and society.They have a very specific role in Samoan society, an interesting contrast to how transgenderism in the rest of the world are yet to be widely accepted. I will resume my discovery of Samoa but for now, slumberland beckons!